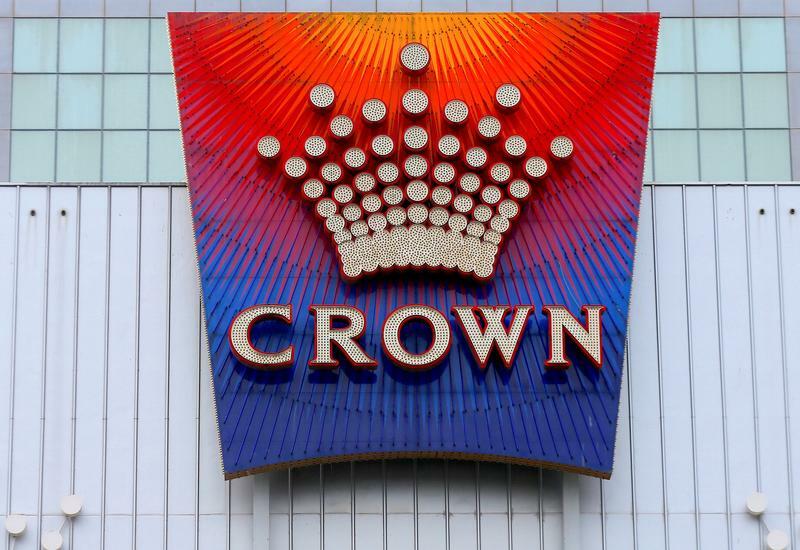 FILE PHOTO - The logo of Australian casino giant Crown Resorts Ltd adorns the hotel and casino complex in Melbourne, Australia, June 13, 2017. Crown Resorts is in talks with Wynn Resorts about a A$10 billion ($7.1 billion) cash-and-stock takeover proposal by Wynn for the Australian casino operator, the company said in a filing to the Australian Stock Exchange on April 9. The proposal has an implied value of A$14.75 a share, half in cash and half in Wynn shares, Crown said in the statement. Shares in Crown Resorts rose more than 20 percent to A$14.11 by 10:40 a.m. (GMT 0040).